and over and over again? Of course you have, they're all over the place! From misquoted movies, incorrect science & historical facts, false behind the scenes info, to even bigoted ideas that people sadly believe because movies still can't let horrible stereotypes go. As such, here are 10 Myths that annoy me and make me want to turn into Colonel nip-picker of the 5th Regiment of being Nosy. Please feel to add your own that annoy you in the comments as there is literally thousands of them. In the movie, Tyler explains that the only reason planes have oxygen masks is because oxygen gets you high and that the only reason they want you to be in the crash position is to more easily identify the body after crash. Both of these are wrong and sadly because of Fight Club and other movies and comedians perpetuating these myths, many have lost their lives. In reality, they are equipped with Oxygen masks because shocker! They help you breathe. Also, the crash position is the best way to help yourself survive a crash. Most survivals of plane crashes can be attributed to this position so if you ever meet a writer of plane crash movie, slap them in the face. If you are discussing Slasher films, You'll probably here people saying the first slashers were likely movies like Psycho or Halloween and maybe Black Christmas. They will probably all however be nearly all American or English speaking films. In reality, the genre can find it's origins from plays preformed at the Grand-Guignol in the 19th century (the Grand-Guignol was a french theater that specialized in horror until it closed in 1962). Even if your only discussing the first slasher films then this is very dubious as slasher films had already been popular in Italian and French films long before works like Psycho had came to being. While Star Trek is an early one, it is by no mean the first. The actual first was from the ITV series Emergency – Ward 10 where the main characters, Louise Mahler (played by Joan Hooley) and Doctor Giles Farmer (played by John White) kissed, four years before Star Trek did it. 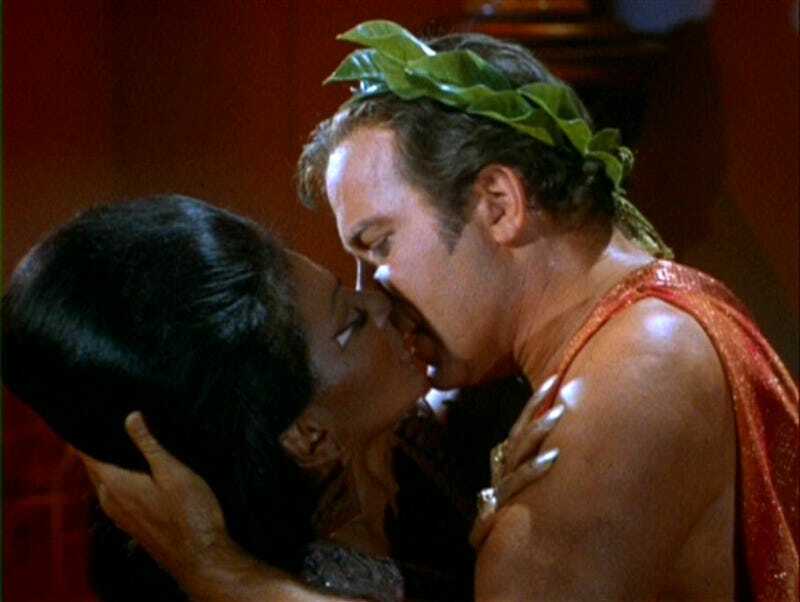 Hell, it wasn't even the first interracial kiss on US TV as shows like Wild Wild West and I Spy had already shown such two years prior to Star Trek (unless you're saying Asians aren't people in which in that case, just leave). According to the myth, the original versions of Pokemon Red and Green, the song played in Lavender Town was higher pitched and caused depression in the kids that played it, even causing suicides. If you believe that... You are an idiot! It is ture that the song was higher pitched but it did not cause depression or suicides (and believe me if it did, you wouldn't be first hearing about it on a forum in 2010). It caused minor annoyance, hence why it was changed in later versions. Youtuber and big Pokemon fan TamashiiHiroka made a series of videos disproving the myth (as well as many others). Now the stereotypes do in fact exist, I've meet them and there is no question about it. But as someone who a good chunk of his family believe in Wicca (four generations) and has been around many Wiccans. I can tell you that the stereotype is really unfair and only supports a small portion of them (like all extreme examples). The majority are probably some of the most nerdy and geeky people you will ever meet. They are usually happy to discuss and poke fun of themselves and their beliefs and come from many different professions. Hell I know one wiccan who is a long standing military Judge. Even if we ignore all the people who are vegetarians because of religious reasons or have medical issues. Not all vegetarians are not pricks. I'm a vegetarian, I've been one for over 11 years. I also care about animal rights, all my pets are ones who have been abandoned and I donate to the RSPCA, the cat protection league and many other animal charities. However, I am not naive enough to think that animal preservation and protection can be done without the need to study specimens and that culling is necessary to save animals form over-populating and damaging the environment and themselves . Most vegetarians who chose to be so are not extremists. They are just normal people with different beliefs. Also, I'm just putting it out there, quorn is delicious and should be in national sale in the US (far better then Tofu). 4. No One Expects The Spanish Inquisition! Actually, not only were the people expecting them, the Inquisition would give you one months notice before they would come for you. The reason for this was that you could get evidence and witnesses to prove you were not a Jew or a Muslim and had converted to Catholicism. In all likely hood, if a group of inquisitors did what they did, they would probably find themselves executed or a least excommunicated. Not true. The mistake actually comes from a mistranslation of, "Tselem Demuth" which really means to have god-like attributes. What the god in the bible actually looks like is never mentioned. Also as a fun bonus, the apple in genesis is also a mistranslation. What was originally written was, "tapuach" meaning scented fruit so it was more likely a fruit like an apricot. According to many science-fiction works (with a surprising amount of Star Trek in that), evolution has a predetermined path and we can reach certain levels of evolution. Even if it's not stated directly, you see this appear in many forms like the stupid humans only use 10% brains myth (looking at you Doom and Lucy). I'll give work like Evangelion the benefit of the doubt because Seele were deliberately trying to make humanity ascend. But Evolution is not a path, there is no levels and a race or species do not evolve themselves to extinction. Simply, evolution is just a form of adaptation through generations so that a species can live better in its environment. Why? Why does this still exist? I'm autistic and I have made it clear that this myth is nonsense. Only 1 out of every 1000 people with autism are also savants like what Rain Man has in the film (though it should be pointed out that person Rain Man is based on is not autistic). Why because he's a coward? Because he lies and is unsociable? Because he is smart (and people can't just be smart right, it must be super powers)? Huh, thanks. You here this all the time like character like Shinji Ikari, Harry Kim, Twilight Sparkle and Barbara Gordan. A lot of autistic people like myself are nice people and should be treated and respected as you would anyone else.